The parish was formed in 1976 and work began on the church building that same year. It was finished in 1979. The architect was Bennie M. Gonzales, whose buildings were known for their avoidance of right angles. Gonzales designed hundreds of churches, public buildings and private homes in Arizona and throughout the world; perhaps his most notorious commission was a residence for the Saudi Royal Family that was constructed by Mohammed bin Awad bin Laden, father of Osama bin Laden. The exterior has a Byzantine appearance and does indeed lack right angles - as does the interior, which is a bright room with a barrel nave and wings at a 45 degree angle to the nave. Behind the altar is a mosaic of the crucified Christ in glory. A Nativity creche was to the right; choir seating and musical instruments to the left. They have a faith formation program for children of all ages as well as for adults. They also have a book discussion group, a grief ministry, and social groups for seniors and singles, as well as Knights of Columbus, Rosary Society and other religious groups. Judging from their bulletin, this is a party-loving parish, with frequent pot lucks and a parish party planned for Epiphany. There are three masses each Sunday plus two Saturday vigil masses, and one mass each weekday. Evening prayer is said each weekday afternoon. Adoration and benediction of the Blessed Sacrament take place the first Friday of each month. Sun City is a retirement community to the northwest of Phoenix. 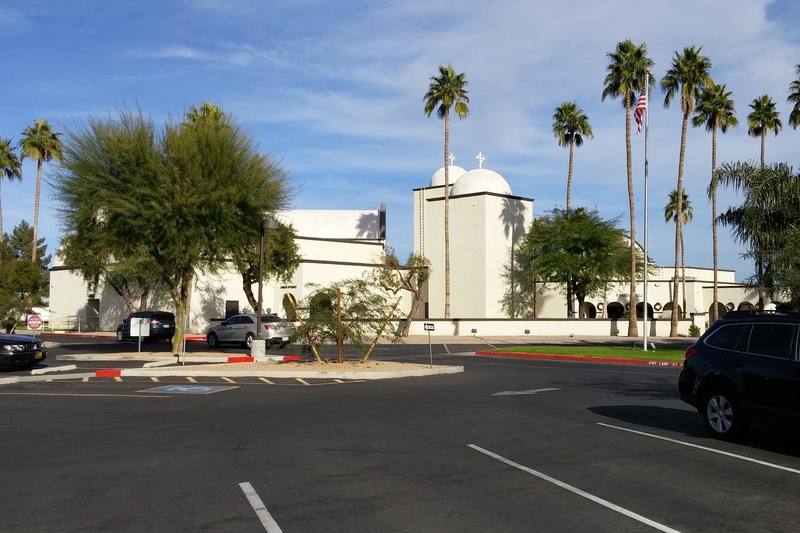 The church is located just north of Bell Road and just east of 99th Avenue, both major thoroughfares in the Phoenix metropolitan area. The surrounding area consists predominantly of single family houses geared toward the elderly who make up the demographic of Sun City. The Revd Kilian McCaffrey, pastor, and the Revd Jim Walker, a visiting priest, concelebrated. They were assisted by the Revd Mr Larry Grey, deacon; and an unnamed crucifer/master of ceremonies and a single acolyte. Mike Wieser, director of music, conducted the choir and played piano. It is a large church; I couldnt count the number of seats. It was completely full. No, but I was very early. A cushioned wooden pew that I thought was just a tad narrow. I arrived an hour early and the church was already beginning to fill up, as I had a feeling it would. People sat quietly at first, but as more came in, the buzz of visiting increased. I'll have more to say in a moment about the contribution the choir made to the pre-service atmosphere. "Our gathering song is 'O Come All Ye Faithful.'" A leaflet already in the pews had the order of service for this mass as well as for all other Christmas masses. There was also a laminated card with the mass responses. Grand piano, acoustic guitar, electric bass guitar. A large electronic organ sat silent. The guitar may actually have been a guitarron - either it was unusually large or the girl playing it was unusually diminutive. There was a choir of seven young girls and young women. Oy veh, did it ever! The principal distraction was the choir. Before mass, they fussed with their music, banged out a measure or two of various songs on the piano, made several false starts singing a line or two of several of the songs, and seemed otherwise to call attention to themselves. Sweeties, that's what choir rooms are for! One of the choristers wore one of those dresses that look like the sleeves are torn at the shoulders and will fall off at any moment. Other than the choir, it was a fairly straightforward concelebrated mass, done with dignity. The pastor began by chanting the Proclamation of the Birth of Christ from the Roman Martyrology. Originally read during the office of prime, which was suppressed by the Second Vatican Council, it was famously restored by Pope John Paul II at the papal midnight mass of Christmas 1980. The mass itself was partially chanted, partially said, with no incense but with bells at all the right places, including the Hanc igitur, which you seldom hear anymore. The eucharistic prayer was the Roman canon. The altar party exchanged the peace via liturgical embrace. The music was traditional carols for the most part except for the service music, which was strictly tuneless, emotionless Singing Nun stuff. The Agnus Dei was what I call the macaronic Agnus Dei: half Latin, half English (Agnus Dei, you take away the sin of the world, miserere nobis). To their credit, the congregation sang lustily but (ugh!) applauded the choir at all the wrong places. Why, I cant imagine - see below. 10 – The pastor spoke with a slight Brogue, which was charming, but with a name like Kilian McCaffrey, that was hardly surprising. He stood on the sanctuary steps and spoke clearly and directly to the congregation. I really enjoyed his sermon. We hear a lot about fake news nowadays, but the Christmas message is not fake news - it's good news; in fact, the best news there is! Christmas is a special rebirth of light in our lives. It is the moment the world was waiting for. People often say that they wish Christmas were every day. But it is! God gives us his Son not only at Christmas, but every day in the mass. Christmas is when God came to us to speak to us in our own language. Listening to Father Kilian's Brogue was heavenly. But oh, Lord help us, that choir! They sang in young girls' voices that would have gone over better at Karaoke night at an Applebee's restaurant than at Christmas Eve mass - and always ever so slightly below the pitch. They had no concept of breathing, dynamics, intonation or phrasing, and apparently thought that singers sound best when looking down at their music stands, letting microphones make up for the resulting lack of projection. Their rendition of "Silent Night" at communion, which they sang as a pattern song with some other number I didn't recognize, was so painful that it was impossible to sing along. I would have left right then and there had I not been Mystery Worshipping. The bass guitarist sang a solo: Mark Lowry's and Buddy Greene's "Mary, Did You Know," which I like a lot, but his microphone was turned up too loud and had too much bass, making him sound like he was singing in a barrel. Cringeworthy. About a third of the congregation left during the singing of the final carol, "Angels We Have Heard On High", but the rest of us toughed it out for all three verses. When that was done, I went forward to snap a photo of the creche, and when I turned around I was surprised to see that the church had pretty much cleared out. I did manage to shake the pastor's and the visiting priest's hands, though. There was none. I had been invited over to my sister's house for lasagna, and so that's where I headed. 5 – My sister tells me the choir really is always that horrible, but if it weren't for them it wouldn't be a bad church to be a member of. They celebrate the mass with dignity and are involved in a number of activities. My sister and brother-in-law do make it their regular, and they say they like it. The pastor's lovely sermon delivered in his charming Brogue.